You can choose Cheque, Money Order or Electronic Funds Transfer in our Checkout! With XPlite and 2000lite we give YOU the power to set up YOUR machine the way YOU want! The power to remove unwanted features, the power to remove upgrades that go bad, the power to strip potential security and privacy threats out by the roots. XPlite and 200lite are world class configuration utilities that enhance Windows by creating modular operating system components that allow YOU to take control of your system. Pick and choose which features YOU need or YOU want! 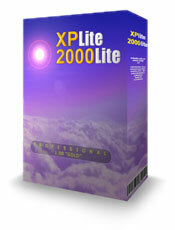 More than a powerful configuration utility - XPlite and 2000lite give you amazing control to repair Windows as well. If a particular technology gives you trouble you can completely remove it, and then reinstall it as cleanly as the day Windows was first installed on your computer. If you have one of our licenses already you can puchase a single user XPlite or 2000lite license with a 40% discount! Copyright (c) 1998-2007 LitePC Technologies Pty Ltd, litePC.com all rights reserved.